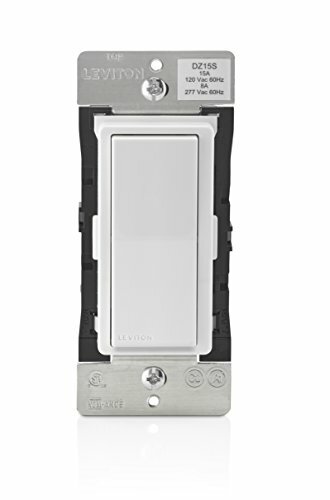 The Z-Wave Plus switch uses the latest generation of Leviton's lighting control technology. It supports LED and CFL technologies up to 600 watts along with support for legacy incandescent lighting loads up to 1800 watts, along with support for fluorescent, resistive, and motor loads. The dz15s is Z-Wave Plus certified, ensuring the latest technology, increased communication range, network wide inclusion, and over the air updates. The highly advanced design features two-way feedback, is scene capable, and is supported by security systems, hubs, and gateways that are Z-Wave enabled, providing remote access and scheduling abilities. Featuring an all new appearance, the true rocker allows users to push the top of the paddle to turn on or the bottom to turn off. To meet any decor, color change kits are available in white, ivory, light almond, Gray, black, and brown. For the most professional and cleanest installation, pair the device with an optional Leviton screwless wall plate. DZ15S is for use with Z-Wave enabled hubs like the Samsung SmartThings, to help facilitate a comprehensive smart home. If you do not wish to use a hub but still desire voice controls and select third-party device integration, Leviton recommends the DW15S. If using in a HomeKit installation, utilize the DH15S.